All of us would have studied about this mineral salt in our chemistry class a few years ago and would have forgotten about it! I had also completely forgotten about the properties and uses of this mineral until my father reminded me. It so happened that a few days ago, the water supply reaching our homes and nearby areas was turbid due to some maintenance work that was going on. Though we use water purifiers for cooking purpose, we somehow wanted to get clear water in our storage tanks that are also used for other purposes at home. Here is when my father's advice worked. He asked me to put a few grains of potash alum in the storage tank. To try it out, I took a 5lt bucket filled with water and immersed a chunk of potash alum in the bucket for 5 seconds and took it out. I let it stand for a day without disturbing it. The next day, I saw the water in the bucket to be crystal clear! All the impurities in the water had settled down and it became easy to separate the clear water and discard the impurities. More than anything else, it is a safe and inexpensive method to get clean water! This is one of the ancient methods of water purification. Water purified from potash alum is free of disease-causing germs, organic matter, and other kinds of waste. Also, alum does not change the taste or the physiological function of water. Apart from water purification, it has many other uses including medicinal uses. 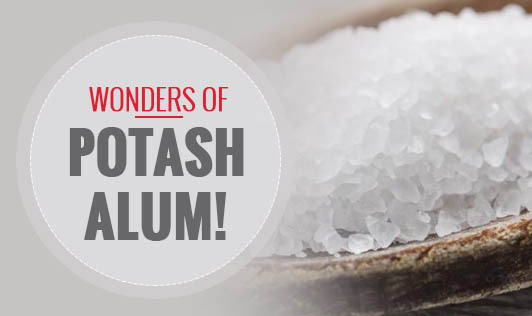 • Alum has astringent properties and hence can be used as an aftershave agent. It prevents bleeding caused by small cuts from razors. However, alum doesn't suit dry skin. • Chinese traditional medicine uses it to reduce itching, toxicity in the body, and clear phlegm. • It is also used as a natural and effective home treatment to cure external hemorrhoids and for skin whitening.